1) You can play a song on one Wifi speaker or. 2) You can play a song on many Wifi speakers. 3) You can also play different songs on different Wifi speakers. 5) You can use different a smart phone (or tablet) playing different songs to different Wifi speakers at the same time. You can play a song on one Wifi speaker or you can play a song on many Wifi speakers. You can also play different songs on different Wifi speakers. You can also set each Wifi speaker to play at different volumes which is perfect for entertaining or individual listening. A maximum of 10 Allplay™ speakers can be connected with no additional hub or hardware required. Available now from Officeworks and Big W! Welcome to next generation wireless music. The LASER WFQ10 WiFi speaker offers better sound, no dropouts and streaming music like Spotify from a smartphone, tablet or PC. Play your music in one room or multiple rooms with all the benefits of Qualcomm's Allplay ecosystem. The benefit of the LASER WiFi music systems is that you don't need a "bridge" WiFi device. Our WiFi speakers connect directly to your WiFi network and can be controlled by anyone's smartphone or tablet. From the app (iOS and Android), you can send music from streaming services, your own playlist or Internet radio to one or many speakers, whether it's LASER branded or other Qualcomm Allplay brands. You can play one song or multiple songs across a variety of speakers and brands and all at different volumes. So say goodbye to cables and wires and put your old Bluetooth speaker away. WiFi speakers are the future of music. 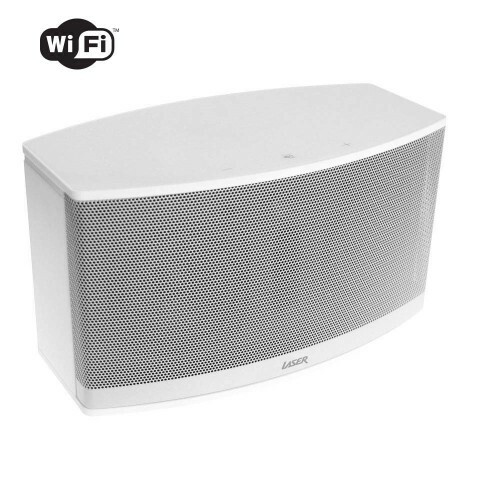 The full range of Multi-room Wifi speakers in our range include can be viewed here with more models to come. Speakers (Full Range) 2 x 3"